Today’s dish is one of the most-satisfying, healthy salads around. It combines several healthy food pyramid components– protein, vegetables, and grains, so in a sense it’s a ‘one-plate meal’. It has the added benefit of being convenient and delicious, not to mention looking gorgeous, too. The centerpiece of this salad is the salmon. In this dish, it’s simply prepared. Now it’s time for a little story. Radd and I have had an ‘on again/off again’ relationship with salmon over the last few years. Have you ever eaten one particular food so often that its no longer appealing? That’s what happened to us. You see, during both of my pregnancies we ate a ton of wild salmon. It’s loaded with omega 3’s, which are important for a baby’s developing brain. So…we went overboard. I’m sure my memory is tricking me now, but I swear we ate salmon three to four times a week. It got to the point where it was almost torturous to sit down to a nice grilled meal. After Aria was born we swore off salmon for awhile. That ‘awhile’ turned into nearly two years, so our kids never really got to try it. Well, we finally came around, gave it a try, and remembered all those things that we love about the fish. And as luck would have it, turns out our kids love it too. Along with the salmon, this salad has those wonderful Spring fava beans and radishes. The beans add a nice ‘pop!’ of color along with their firm texture, while the radishes give the dish a healthy crunch. Another ingredient is black rice. Not familiar? You can read about it here. Aside from looking pretty cool, it’s loaded with fiber and iron. It’s also an anti-inflammatory and great source for antioxidants. I used ‘forbidden’ black rice in this dish. The texture is the same as a firm white rice, but the flavor is a bit more ‘nutty’– kind of like wild rice. If you can’t find black rice, you can use wild rice, quinoa, or wheat berries. All will work well here. The final ingredient is a mustard tarragon vinaigrette, which brings all of the flavors together. It’s worth experimenting with tarragon vinegar, if you can find it– it’s so interesting. Tarragon has a strong anise-like flavor, so make sure it suits your palate before you add it to the vinaigrette. And if you don’t have it, a nice white wine or champagne vinegar will work just fine. Enjoy! To begin: Place the rinsed black rice in a medium sauce pan with a scant 1 3/4 cup of water. Bring to a boil uncovered. Then cover and reduce heat to low and cook for about 35 minutes, or until the rice is tender and the water has been absorbed. If the rice is tender, yet a bit of water remains, just drain it off. Fluff with a fork and set aside. Meanwhile, preheat an oven to 375°F. Line a large baking sheet with aluminum foil. Place the salmon on it along with a drizzle of olive oil and salt and pepper. Bake for about 15-20 minutes, or until it just barely flakes when you twist a fork into it. Keep in mind that it will continue to bake after you remove it from the oven from the residual heat, so be careful not to over-bake. Remove from oven and break apart into chunks, when cool. Prepare the fava beans by placing the shelled beans into a small saucepan of boiling water. Boil for about 2 minutes. Drain water and place beans in a bowl of ice water. Remove the light green peel. Set beans aside. To make the vinaigrette: place the garlic, shallot, Dijon, vinegar, salt, pepper, and hot pepper flakes into a bowl. Slowly whisk in the extra-virgin olive oil. Taste. Adjust seasonings, if necessary. 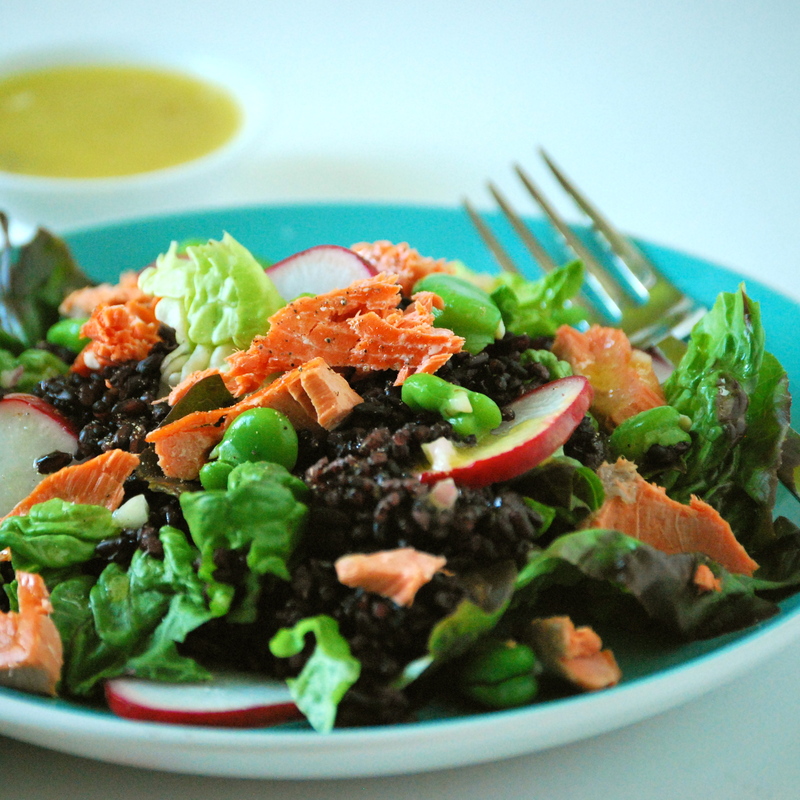 On a large platter, place the torn lettuce, black rice, salmon, radishes, and fava beans. Pour the mustard tarragon vinaigrette over the salad and gently toss. Ricotta salata cheese also works very well with this meal. Enjoy! Oh yum! Black rice…is it sticky? It can be — I rinsed mine, so it wouldn’t be. Often people make a wonderful dessert pudding with black rise and coconut milk. Hello gorgeous salad! So refreshing and healthy looking! Yum!